Since 2nd July Kurd forces have fiercely resisted an offensive waged by ISIS jihadists in the canton of Kobanê, the central of three autonomous Rojava cantons, targeting the strategically important Kobanê city. 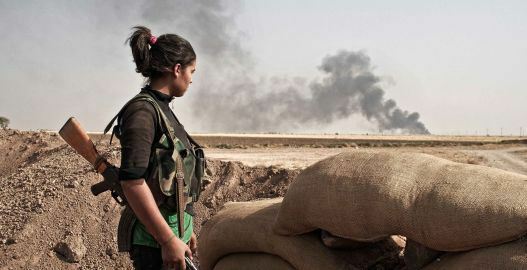 According to a statement by the Syrian Observatory for Human Rights (SOHR), yesterday 16 Kurdish fighters were killed in the northeastern part of the township of Ain Eisa, four in an ISIS suicide bomb attack, while more than 20 ISIS terrorists died in battles elsewhere. Sources close to the Kurdish YPG say ISIS has suffered scores of casualties this week. Firat News reports that ISIS targetted the villages of Kendal, Girê Sor, Bîr Kîtik and Qîz Elî.with tanks, armoured vehicles, artillery and mortars. The Rojava authorities have responded to the ISIS offensive by announcing a general mobilisation . Salih Muslim, leader of the pro-Kurd PYD has accused the Turkish authorities of enabling ISIS to attack Kobanê. “It is not that easy to convey weapons to the area in Kobane under attack”, he said. “There is a bridge on the road and that is the only means of access, but hundreds of ISIS members have arrived with heavy weaponry behind the area where our comrades are. So either they have come from Turkey or they have gone into Turkish territory and come out again. There is no other road”.